arms. However, the oxygen did not flow to the wound in the sham arm. In essence, this is on par with a pharmaceutical trial where the patients and clinicians do not know the treatment arm. Registry: These results are bolstered by those from our post-market surveillance registry that demonstrates a success rate of 74% in 59 days in the field for a wide variety of wounds. 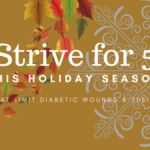 These wounds range from small, persistent ulcers to large Stage IV ulcers and include dehisced surgical wounds, large venous ulcers, and acute surgical incisions, to name a few. It is important to note that this success rate is on very difficult wounds that have already been unresponsive to other advanced therapies such as NPWT and HBO and had been open for an average of 359 days (as a new technology, CDO is typically first tried on challenging, unresponsive wounds). More details of the current registry results can be found on our website (eo2.com). Dr. Stephanie Wu (Rosalind Franklin University, Chicago, IL): prospective study looking at wound closure, pain reduction (VAS), reduction of inflammatory cytokines (Luminex bead-based xMAP technology 18 cytokine analysis), VEGF, genetic markers (RNA expression of wound biopsies, as well as Targeted Quantitative PCR), quality of life/activity levels, bioburden reduction. A case study from Dr. Wu’s first patient (prior to the study) has been published in Podiatry Today1. This case demonstrates a marked pain reduction upon application of CDO. See graph from EO2 Case Study 690036: pain reduced from 8 to 3 upon application, rose to 8 upon withdrawal of CDO during treatment, then reduced quickly to 3 upon reapplication of CDO. Dr. Gabriel Urrea-Botero (Gonzaba Medical Group, San Antonio, TX): retrospective analysis on the impact of CDO in chronic toe ulcer healing for 20 patients. As Published in Podiatry Today1, results include an overall success rate (full closure) of 74% on wounds that were unresponsive to other therapies, which compares very well to the EO2 registry (eo2.com). The author highlights a chief benefit being that of high patient compliance (95%), which he attributes to the device’s ease of use, the noticeability of improvement within a short period of time, and the reduction of pain. Reprints available (EO2 White Paper 690076). Dr. Mark Couture (Central Texas Veteran’s Healthcare Administration, Temple, TX): retrospective analysis of 25 patients in a Veteran’s Healthcare Administration environment. As Published in Podiatry Today3, results show 68% full closure, both as a stand alone and adjunctive therapy. The author found that CDO improves wound healing potential, even in wounds receiving tissue/skin substitute applications. These outcomes are also compared to outcomes in other published studies, as well as EO2’s registry. Reprints available (EO2 White Paper 690080). Dr. Tracy Marshall (Associated Foot & Ankle Specialists in Phoenix, AZ): prospective trial of 20 patients investigating decreased healing time, pain reduction and better scar cosmesis early on for standardized incisional wounds using CDO therapy as a standalone treatment immediately following surgery. Wounds were found to heal several weeks faster with CDO and the appearance of the wound showed much less erythema, the absence of vascular embarrassment on the wound edges and generally a more healthy pink color was manifested peri-wound. Completed, in preparation for publication. Mary Sue Ingersoll, Joanne Bowen, RN CWS; Robin Carlson, PT CWS (Advanced Wound Consultants, Chicago, IL): prospective trial of 20 patients to investigate reduction in pain in patients with chronic lower extremity ulcers. 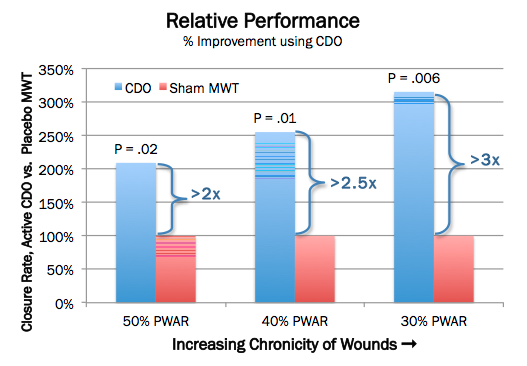 Wounds were found to have pain relief quickly after starting CDO: most experienced dramatic pain relief within several days. Completed, submitted for publication. Dr. Larry Lavery (University of Texas Southwestern Medical Center, Dallas, TX): prospective study of 20 patients investigating perfusion changes in the wound bed (using Hyperspectral imaging (Hyper Med), Skin Perfusion Pressure measurements (Vasa med) and Transcutaneous oxygen measurements), changes in inflammatory cytokines (IL-6, IL-8, TNF-α) and growth factors (VEGF, PDGF, IGF, TGF-β), and reduction in bioburden. In progress. Drs. Bijan Najafi, Miguel Montero, Jeffry Ross, Brian Lepow & Joseph Mills (Baylor College of Medicine, Houston, TX): prospective study of 30 patients investigating effect of CDO on surgical wound closure post minor amputation using a control group (no oxygen). Outcomes being investigated include reduction in post-surgical complications, changes in skin perfusion, changes in quality of life (including pain, anxiety and physiological stress) and assessing user perception of benefit, user-friendliness and acceptability. In progress. Dr. Aksone Nouvong (University of California, Los Angeles, CA): prospective trial of 5 patients to demonstrate the clinical effectiveness of CDO by initially assessing oxygen perfusion in patients with chronic venous leg ulcers, and then observing the effect of CDO on perfusion as wound healing progresses. In progress. Urrea-Botero G. Can Continuous Diffusion of Oxygen Heal Chronic Toe Ulcers? Podiatry Today 28(10) 2015. 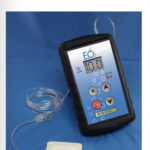 Couture M. Does Continuous Diffusion Of Oxygen Have Potential In Chronic Diabetic Foot Ulcers? Podiatry Today 28(12) 2015.